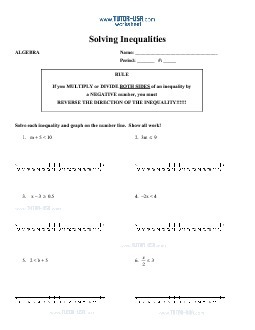 This free algebra worksheet begins with the rule stating to reverse the sign of the inequality when multiplying or dividing both sides by a negative. Students must use this rule and inverse operations to solve inequalities and graph their solution on a number line. REVERSE THE DIRECTION OF THE INEQUALITY!!!!!! Solve each inequality and graph on the number line. Show all work! Solve each inequality. Show all work.